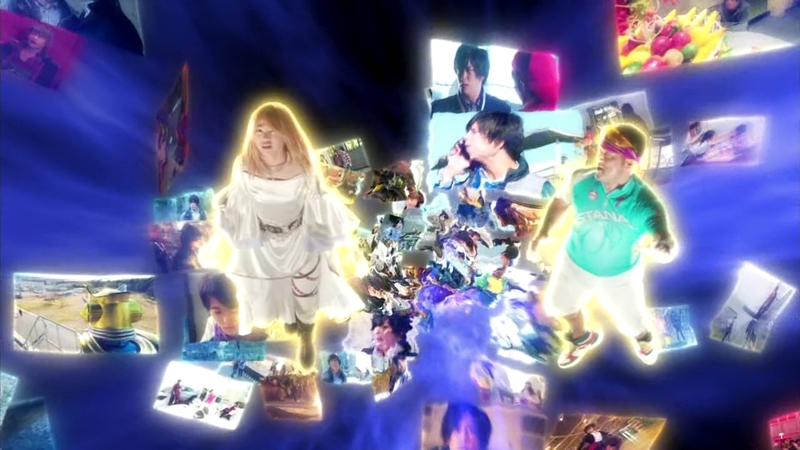 While Kota and Mitchi’s battle rages on, Mai is in her headGarage as Sagara shows her flashback clips of Kota, Mitchi and Kaito all sacrificing their lives all for her, to obtain the Golden Fruit. But why them? Mai asks. Sagara says they just happened to stumble upon the power that decided their fates. And now the Forbidden Fruit is in her hands. She may not have asked for it, but she now has the power to do absolutely anything. And what will that be? She decides to accept the power in the hopes that she can change their fates. Ryoma looks at Mai, wondering what she’s dreaming about as he gets ready for the extraction. Are you trying to kill yourself!? Kota asks. I’ll gladly die if it means I could get rid of you! Mitsuzane replies. Mitchi shoots at Kota and says even if Mai-san will never favor him, it will be better than her falling into Kota’s hands. Mitchi readies a Yomotsuheguri Squash and Kota also prepares a counter attack. But as Mitchi leaps toward Kota, Kota drops his weapon. He takes a sword right to the gut, but then he reaches for the demonic Lock Seed and rips it off Mitchi’s belt. They both de-henshin. Mitchi cannot believe it. Kota did it on purpose. Why!?! “Until recently, we were friends, right?” Kota crushes the Lock seed in his hand. Kota crawls toward Mitchi, grabs him, pulls him down to kneel in front of him. Mitchi pushes Kota to the floor, but Kota gets up and pulls Mitchi into a hug. Kota collapses into the bed of feathers. “Of course I can’t be forgiven!” Mitchi slams the floor, crying. 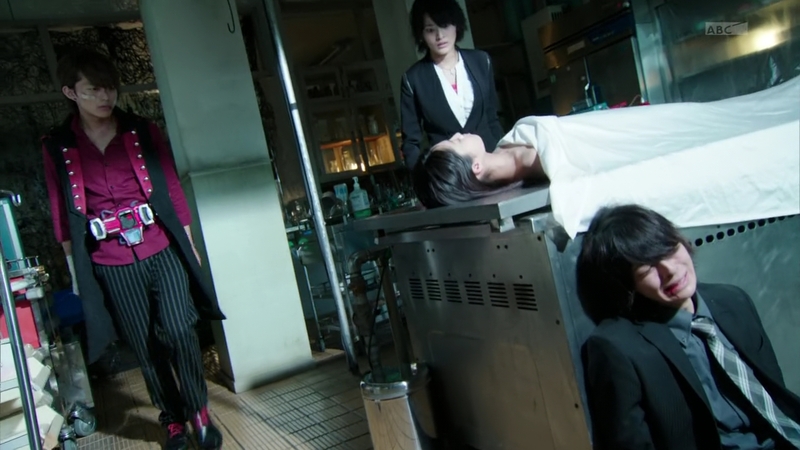 At the Garage, Minato has bandaged up Kaito when Peco and Chucky arrive to tell them about Mai. Mitchi returns to the abandoned hospital. 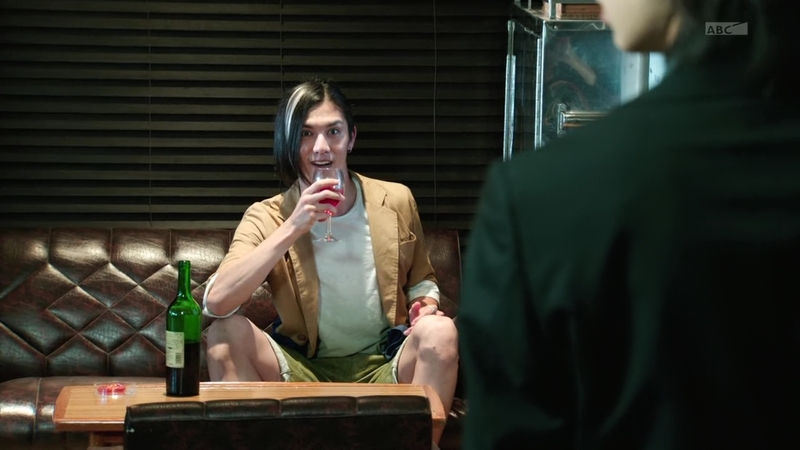 Ryoma is enjoying a glass of wine. He laughs that Mitchi has defied his expectations by surviving as well as defeating Kota. Mitchi asks where Mai is. Ryoma says the operation was successful. But when Mitchi runs in to see her, there is a white sheet covering the table. He pulls it open and sees a dead Mai. Mitchi collapses to the floor. Ryoma holds the Golden Fruit in a jar and says how difficult it was to take when it had completely fused with Mai’s heart. Mitchi can’t believe it. Ryoma said he would save her! But Ryoma says he shouldn’t have believed him in the first place since Mitchi knew he was only after the fruit. 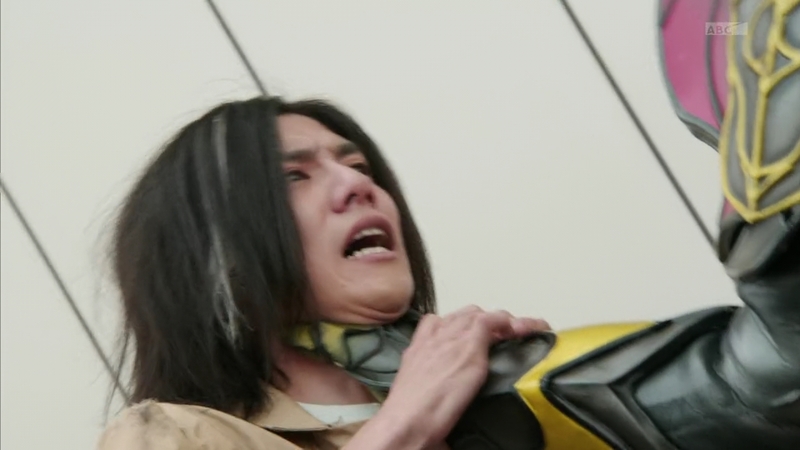 Mitsuzane is absolutely beside himself. He crawls on the floor as Ryoma proceeds to mock Mitchi’s gullibility. Mitchi takes his Genesis Driver out, but Ryoma has a kill switch that fries the belt. He included one knowing that he’d have to face people with Genesis Drivers in the future. Mitchi wants to attack Ryoma, but the professor just knocks him over and proceeds to kick and beat him. 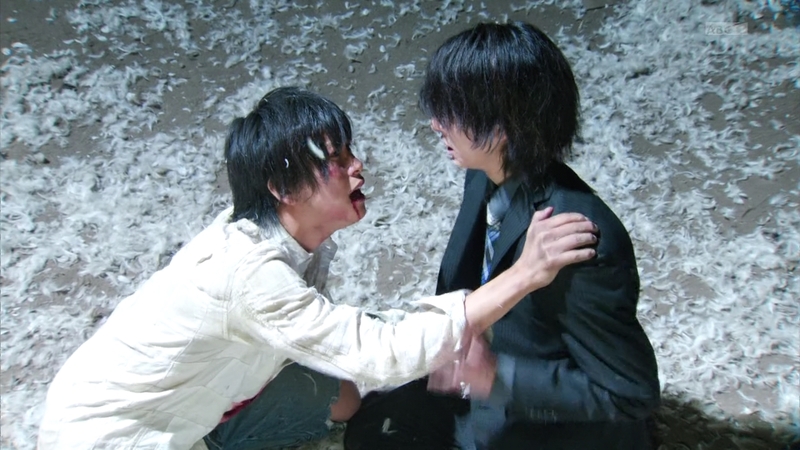 Didn’t Takatora teach Prince Kureshima, his little brother to not be a naughty little boy? It’s when little boys are naughty that they fall prey to evil adults. Ryoma chokes Mitchi, cackling when suddenly the Golden Fruit glows. 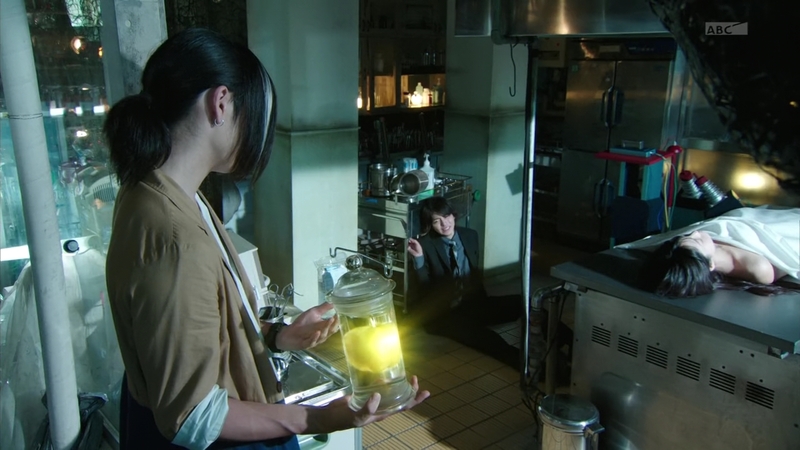 Ryoma lets go of Mitchi to see the jar break as the Golden Fruit flies up before turning into an image of Mai! Mai floats through Ryoma and over to Mitchi. She places her hand on Mitchi’s face before walking over to her dead body. Ryoma cannot believe what just happened. Mai is flying back in time. Sagara says this is too much, even for the Golden Fruit. She may not be able to say what she wants even if she does go back. But Mai says she must try. She returns to the moments she first spoke to Kota, Mitchi and Kaito as the First Woman, but she is unable to say what she wants. 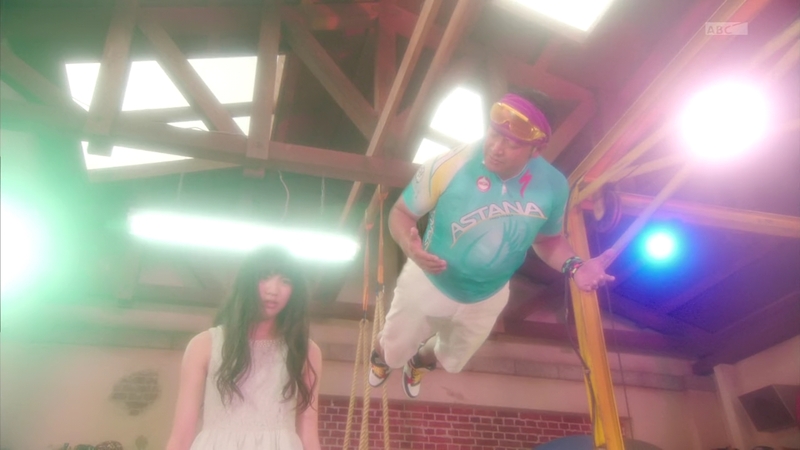 Mai and Sagara are on a rooftop. She asks why he encouraged them to fight. Sagara says it is always hard for him to discern who will obtain the fruit. But this time it was easy because those three had already been influenced by the future. Mai heads back through the purple time portal, now helpless. Kaito and Minato arrive at the hospital where they find a distraught Mitchi still crying. He curls up in a ball on the floor. Kaito sees Ryoma trying to figure out how and what just happened. Ryoma tells Kaito not to bother him. He is frustrated that he had the Golden Fruit in his hands and has now lost it. 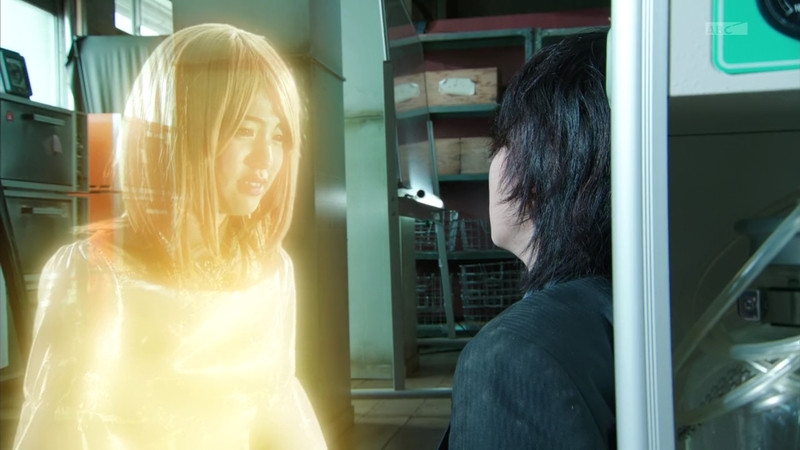 Minato tells Kaito that Mai is indeed dead. The two of them take their Genesis Drivers out, but again, Ryoma presses the kill switch on both. Fine then. Kaito takes out his good ol’ basic Sengoku Driver. It’s true the Sengoku Driver has no kill switch, but it wasn’t necessary anyway. Both Kaito and Ryoma henshin and they battle. Minato follows them outside as Mitchi still cries on the floor. Ryoma says now that Kota has been taken of, there’s nothing standing in his way. 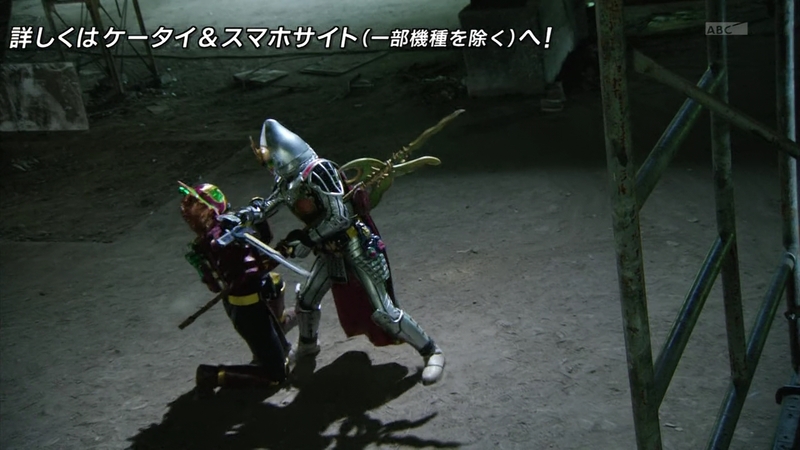 Kaito will not have any of this, but Ryoma delivers a finishing shot towards him and he de-henshins. Kaito is not giving up, but his wound acts up again. Ryoma de-henshins and walks over to look at it. A pity it is too late to treat it, Ryoma says. But he is amazed Kaito can even move with it. 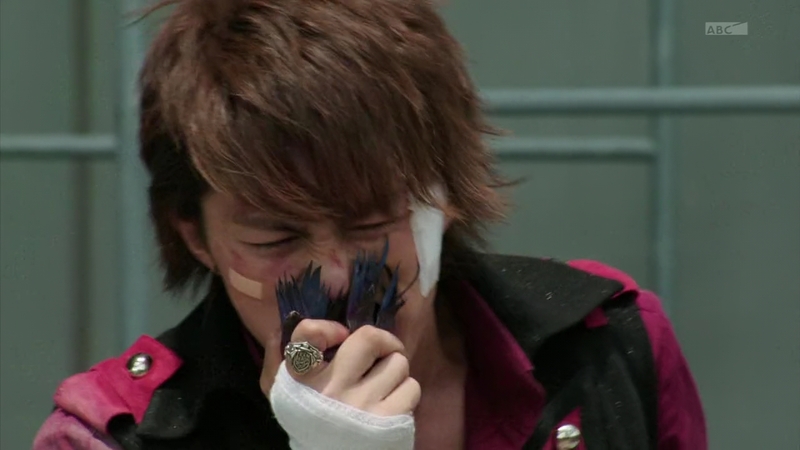 Kaito says he will overcome any pain, but Ryoma says this kind of pain is not something that can simply be overcome. Kaito says he has overcome the pain of being weak since he was a kid. 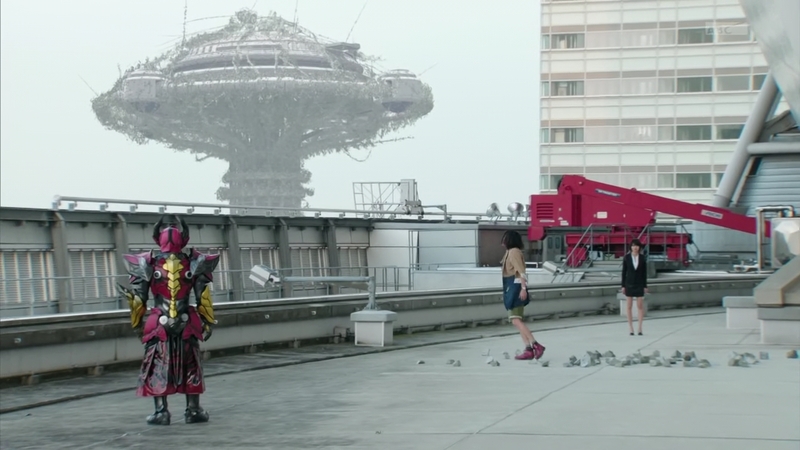 Minato arrives on the rooftop just as Kaito grabs a Helheim fruit. “Have you lost your mind! ?” Ryoma asks as Kaito threatens to eat the fruit. Kaito bites into the gooey fruit and stumbles his way towards Ryoma. 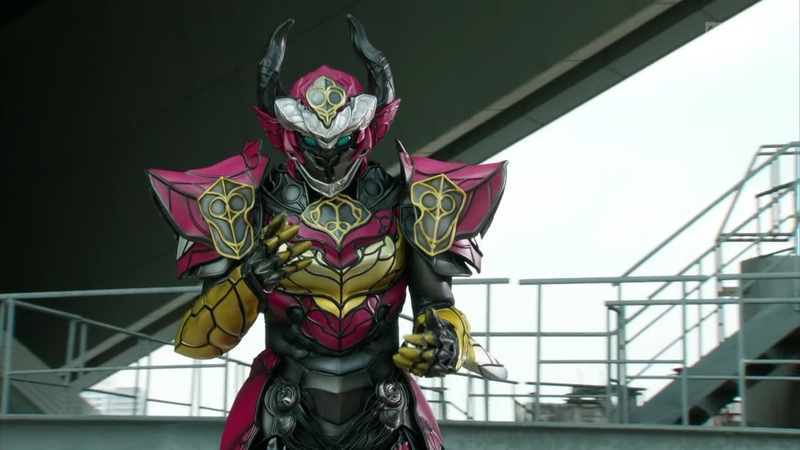 Suddenly, the Helheim veins sprout from his body and Kaito has become not just an Inves, but a full Overlord! Kaito cannot believe this immense power he has just acquired. Ryoma cannot believe a human has surpassed humanity without his Drivers. He sees Ryoma’s hubris and proceeds to lay an absolute beat down on him. Kaito drags Ryoma, henshined, all over, knocking him around, exacting pain. Kaito gets Helheim vines to wrap up Ryoma until he de-henshins. 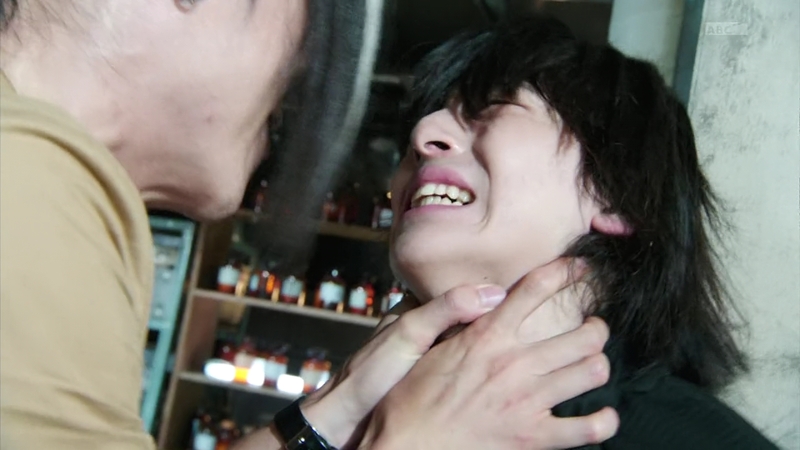 The vines bring Ryoma to Kaito who grabs him by the neck. 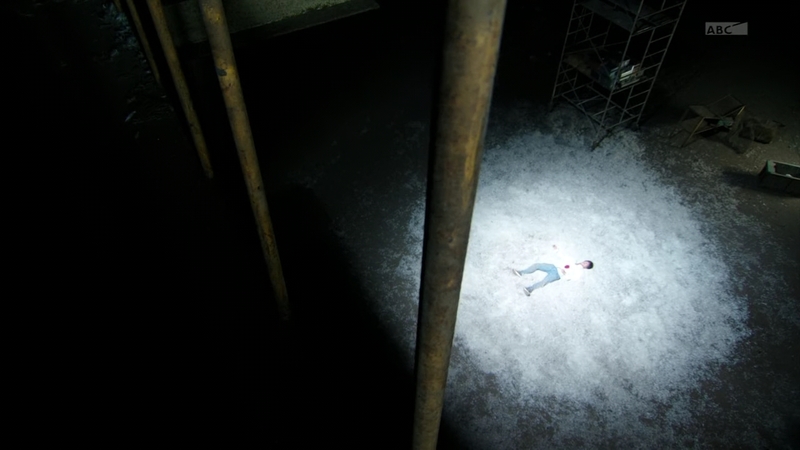 Kaito punches Ryoma directly into the exterior wall of the building, leaving a huge imprint in the concrete. Ryoma struggles to move on the floor, but he still cackles. Ryoma stumbles toward the edge of the rooftop until he loses consciousness and falls off. Kaito de-henshins from his Overlord form. His wound is now healed. 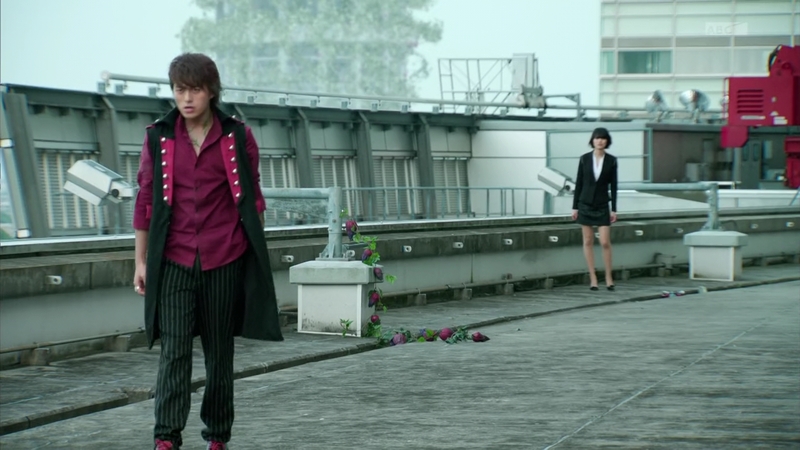 Kaito turns to walk away as Minato picks up his Driver and Lock Seed. This is a children’s show. Yes. This is a children’s entertainment program. Damn, seriously though. Such an incredible episode. The drama, the emotion. Wow. Just wow. We’ve seen Mitchi’s inner struggle, him feeling intense pain and guilt and realizing there is no turning back no matter what. 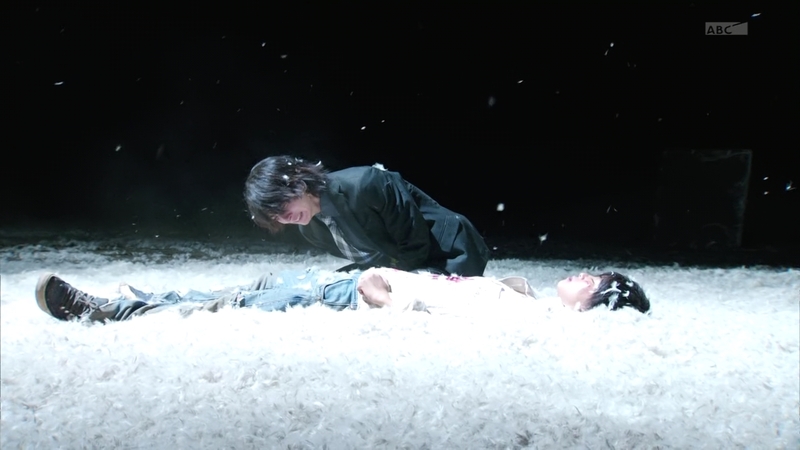 That scene of Kota and Mitchi reminded me a lot of the horribly tragic final scene (I refuse to accept anything that happened in the 15 minutes after it) of the Korean drama Warrior Baek Dong Soo. There’s a lot of parallels between Dong Soo & Yeo Woon and Mitchi & Kota, though I would’ve put in a little more about Mitchi actually caring about Kota almost as much as Mai even through his psychotic stage. Still, it really was stunning to see Mitchi just dissolve into a blubbering mess. I had a feeling we weren’t going to see a dead Mitchi just yet, especially not with a few episodes left in the season. But seeing him pretty much incapacitated by the death of Mai was really just amazing to watch. 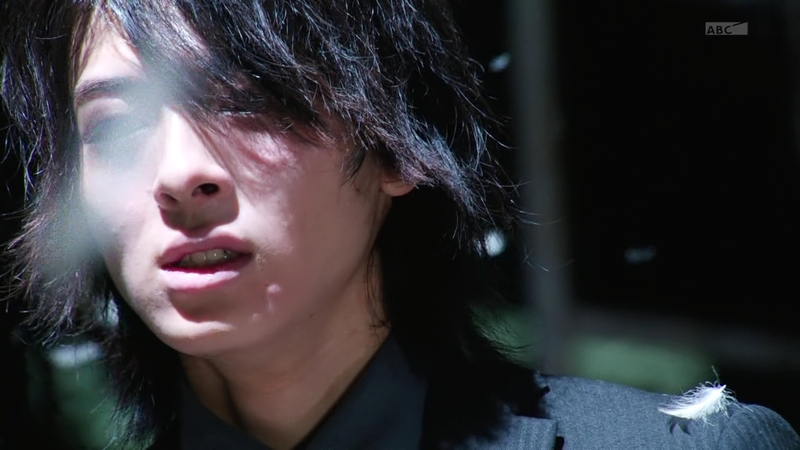 Seriously, Takasugi Mahiro is the MVP of this season. Damn. Ryoma’s descent into madness was a slowburn throughout the season, but this episode definitely just brought everything to a scalding boil for his character. That he was his own undoing is poetic. Mocking Mitchi for being a naive kid when he himself ended up being the one who knew nothing in the end. The violence in this episode was just off the charts. Again, this IS a children’s program, right? (lol) Insane beatdowns and fights and, sh*t dude. Wow. As the show has done all season, you’re just left speechless. And I haven’t even touched on Mai going back in time or Kaito becoming an Overlord. 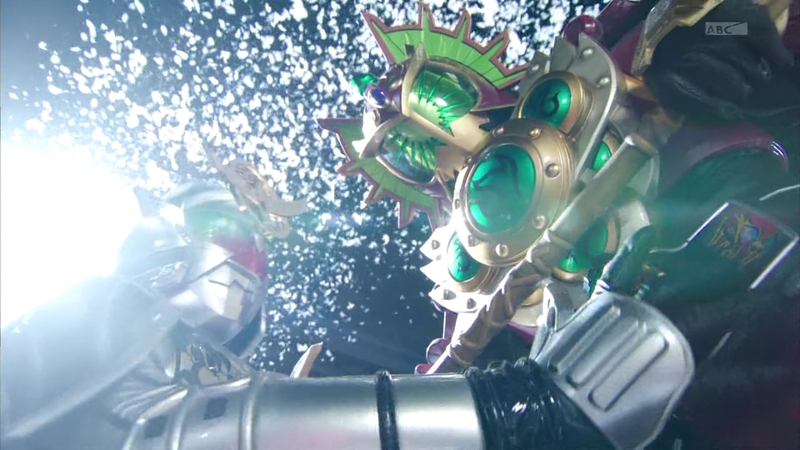 It is definitely “Shuppatsu shinkou!” for Gaim right now and what an experience it is. Okay, the “raining feathers” scene does feel a bit weird. But, oh boy! This episode isn’t crazy. It’s downright CRUEL! Damn you Urobuchi!! How much more pain and suffering will these people have to go through before you are satisfied?! Okay, so we all knew that Mitchi had it coming. But, come on! Even for the guy, that’s way too much. He practically saw with his very own eyes how pointless everything he did turned out to be. 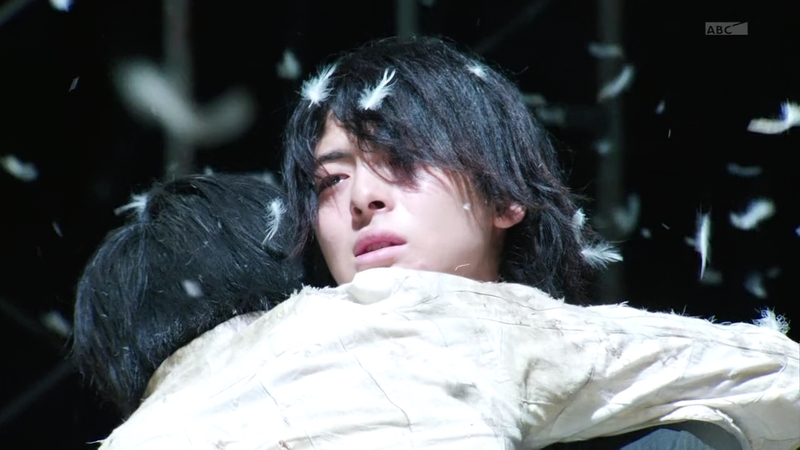 No wonder the guy ended up a sobbing mess (got to give props to Mahiro Takasugi for that performance). 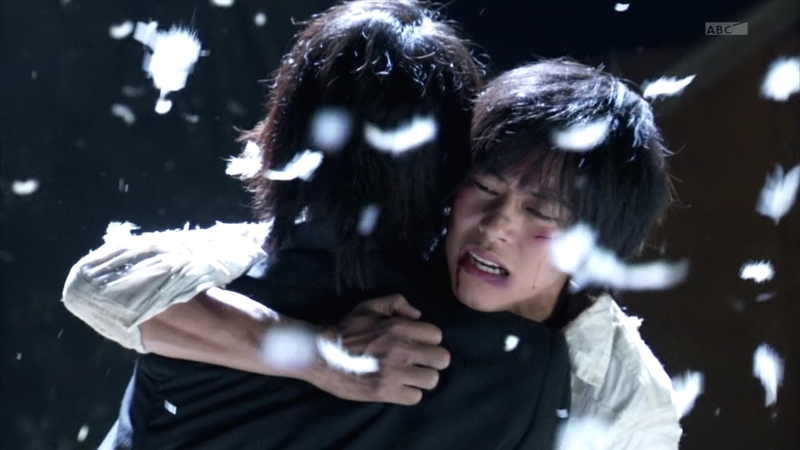 And I really love the way they did the last moments of the fight between Kouta and Mitchi. 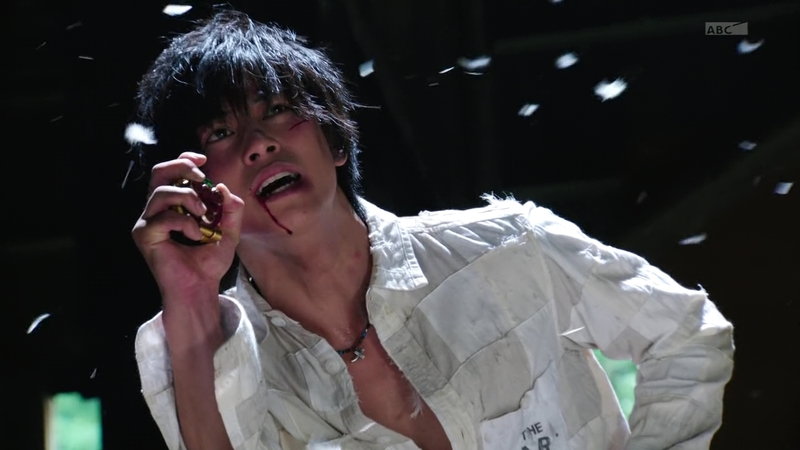 The moment Kouta let go of the Musou Saber, it was a really excellent “Oh hell, no! NOOOO! !” moment for the audience. And I must stay, Kaito’s transformation into an Overlord is really intriguing. It isn’t much about the guy’s quest for power anymore, but more on desperation and anger> Seeing Mai dead and Mitchi a broken boy really pushed Kaito to the edge, made even worse by his inability to beat Ryouma. Now, this really makes me wonder if him batting kouta is simply him seeking a means to free himself from all that “power is the only thing in the world” mindset he long held. On a side note, I really can’t help but wonder why Pinoy teleseryes can’t seem to perfect these death scenes (coming from a KID’S SHOW nonetheless). Character deaths in teleseryes tend to be overly dramatic and noisy (With the background song cranked up way too high). The only ones i can recall in recent memory that came close this kind of impact was that of Lorna Tolentino’s character in Minsan lang Kita Iibigin and Johng Hilario’s Gary in Mara clara (okay, I know we’re polar opposites on that series 😉 ). Should be interesting to see what happens to Kaito as apparently he will also be facing best bud Zack for his becoming an Overlord. God I’m going to be sick if that fruit yuck! Sorry. I love Kaito’s overlord form it’s looks a friggin badass version of the “Bana Bana Banana!” Ok it is kinda stupid but I laughed when Lemon guy asked “what just happen?” Because if a person from a past or future saw that they may ask the same thing but Mr Lemon isn’t good so he’s a fu*king sh*t.